Investors await Bernanke, and a doctors group wants to ban a popular consumer product. Those and more are what's in business news Wednesday. The streak of triple-digit moves for the Dow industrials (^DJI) is now at six in a row. The Dow rose 138 points Tuesday, the S&P 500 (^GSPC) added 12 points and the Nasdaq (^IXIC) gained 30. Despite the recent volatility, investors could press the pause button until the Federal Reserve releases info from its policy-setting meeting Wednesday afternoon, and Chairman Ben Bernanke answers questions about when and how the central bank will begin to cut back on its stimulus efforts. He'll likely try to manage investor expectations about Fed policy. The American Medical Association is calling for a ban on the advertising of high energy drinks to kids under 18. 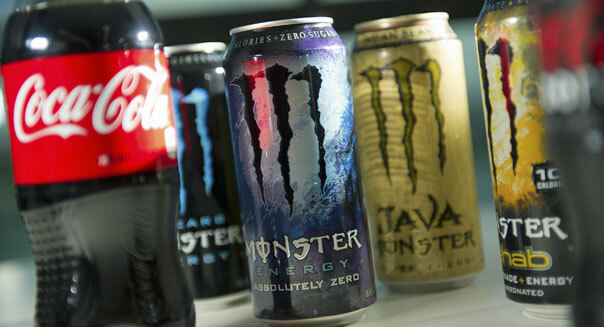 The group is concerned about studies showing drinks such as Monster Beverage and Red Bull are linked to heart and other health problems. PepsiCo (PEP) and Coca-Cola (KO) also make highly caffeinated energy drinks. Viacom's (VIA) Nickelodeon unit is refusing to bow to critics who want it to stop airing ads for foods that don't meet certain nutritional standards. According to The New York Times, Nickelodeon says its mission is to make quality entertainment programs, and it will leave the science of nutrition to the experts. FedEx (FDX) earnings topped expectations and revenue edged higher. The company is often considered a bellwether for the broader economy, as it touches almost all segments of business. Prior to the numbers, a Raymond James analyst said FedEx is still an attractive long-term investment. Adobe Systems (ADBE) earnings tumbled 66 percent from a year ago, but still beat expectations. The business-software firm cited strong demand for its subscription-based Creative Cloud package. Furniture maker La-Z-Boy (LZB) is sitting pretty after topping expectations, and Eli Lilly & Co.'s (LLY) Zyprexa is under scrutiny after the deaths of two patients taking an injectable form of the anti-psychotic drug. The company and the Food and Drug Administration are investigating. When it comes to sweet, rich, bottled coffee, it's hard to beat Starbucks. Then again, at 200 calories and 3 grams of fat per bottle, Starbucks' Frappuccino is hardly a healthy drink. For 34 percent less, my local Asian market offered several other canned coffees, including Pokka and Sangaria. While not quite as tasty as the Frappuccino, Pokka has just over half the calories and one-sixth the fat. And, for those who are really serious about cutting back on the bad stuff, Ucc's unsweetened black coffee has all the caffeine but none of the calories or fat. Given that Red Bull is a copy of Krating Daeng, a Thai energy drink, it isn't a surprise that Asian markets often offer an impressive selection of caffeine-packed sodas. What is surprising, however, is how much better many of them taste -- and how much cheaper they are. In an office taste test, the staff of DailyFinance universally preferred the flavor of Roaring Lion, an energy drink that's almost exactly like Red Bull, but has a lighter, more citrusy flavor and costs 26 percent less. Yunker, a Japanese energy soda was even better: Packed with herbs, B vitamins and Coenzyme Q10, it had a mild, almost lychee-like taste -- for about the same price as Red Bull. In recent months, coconut juice has really come into its own. Little surprise: With twice the potassium and half the calories of a banana, a bottle of Zico is a healthier alternative to soda or fruit juice. Unfortunately, the flavor leaves something to be desired -- it tends to be a bit watery and slightly stale-tasting. On the bright side, Asian markets generally offer a wide array of other, more flavorful options. In an office taste test, most of DailyFinance's writers preferred the Taste Nirvana brand. Unlike Zico, it's not reconstituted, and its flavor was a lot fresher and more vibrant. And, as an added benefit, it's 16 percent cheaper than Zico. From Arizona to Snapple, Lipton to HonesTea, convenience stores are packed with iced tea options. But the amazing array available in the local 7-Eleven pales beside the choices in many Asian markets. Everybody's got green tea and chai, but where else will you find rose petal and bergamot flavored black tea or Jasmine flavored green tea? If you really want to expand your horizons (without spending a lot of money), Asian markets should be high on your list. While it's great to get lower prices on some of your favorite drinks, the real joy of Asian markets lie in their incredible selection of weird stuff. You may not fall in love with basil seed drink or grass jelly drink or melon cream soda, but if you're looking for something a little different, they definitely fill the bill. And, at a dollar or two per bottle, these little adventures in other cultures are a real bargain.